There are many ways to build the drawers. I have settled on a particular technique for the furniture I build which provides what I think is a good combination of elegance, ruggedness and reasonable ease of building. 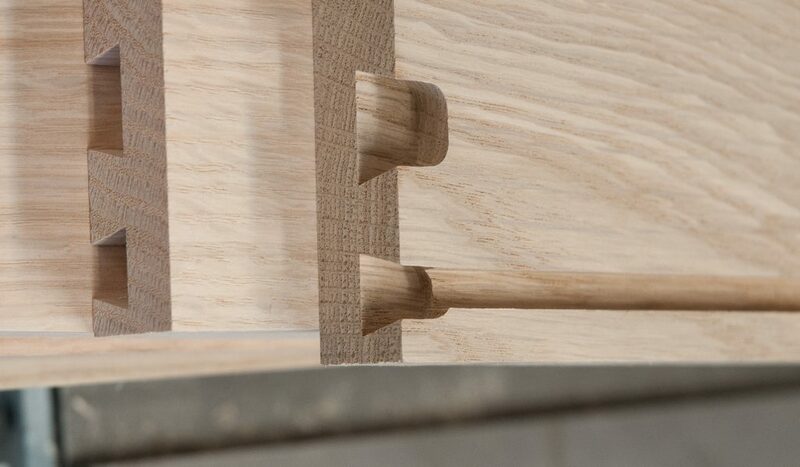 This combines dovetails for the fronts, dadoes for the backs and bottom. The bottom is also completely captive which helps square up the assembly. Once the dovetails are cut in the sides and fitted it is time for the easier tasks. The first is to cut the dadoes in the sides for the backs. 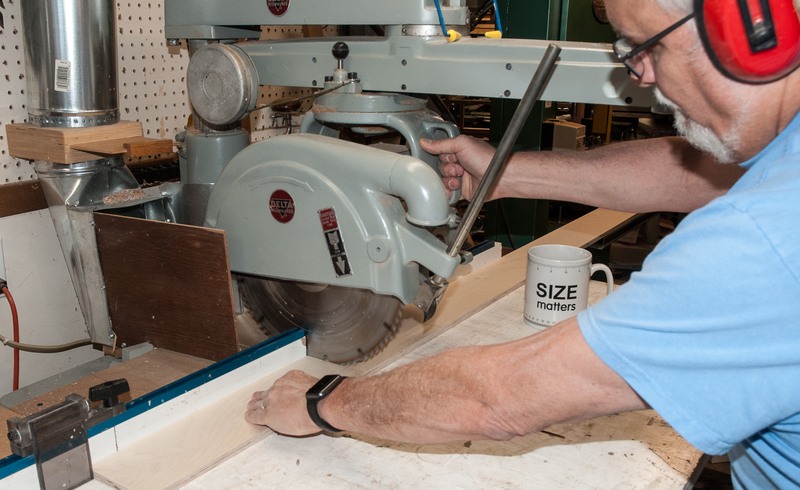 I typically set this up on the smaller radial arm saw using a 8″ Freud stack dado set. In this case the plywood is 12 mm thick which requires almost all of the shims in the set. 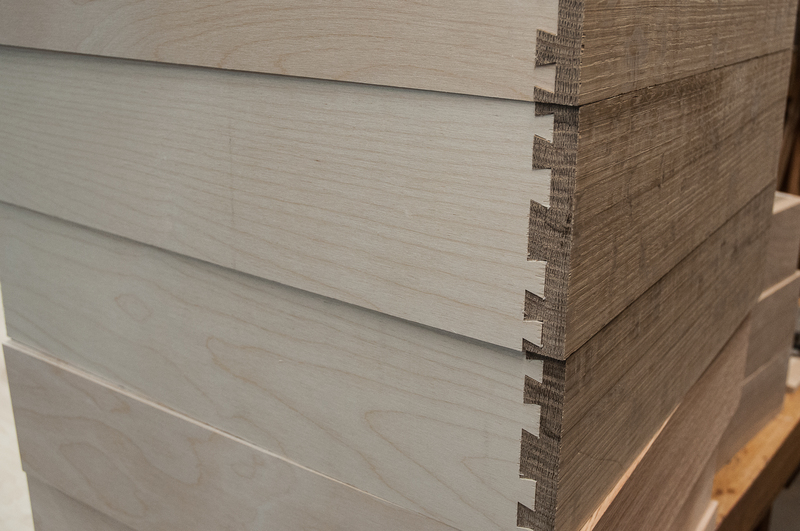 The dado depth is just under 1/4″. I leave 1/4″ of wood behind it which makes measuring for the bottoms easier (outside box dim – 1/2″ = the bottom dimension). I usually set a stop for the distance from the rear ends. Pay attention to the distance from the front. The dresser is just over 18″ deep and the drawer bottoms can reasonably be 16″ so you can get 3 pieces from the width of the standard sheet of plywood. The backs are cut to length on the big radial arm saw, again using a stop. When cutting the fronts and sides to width I cut 2 extra strips of plywood, ready for the backs. 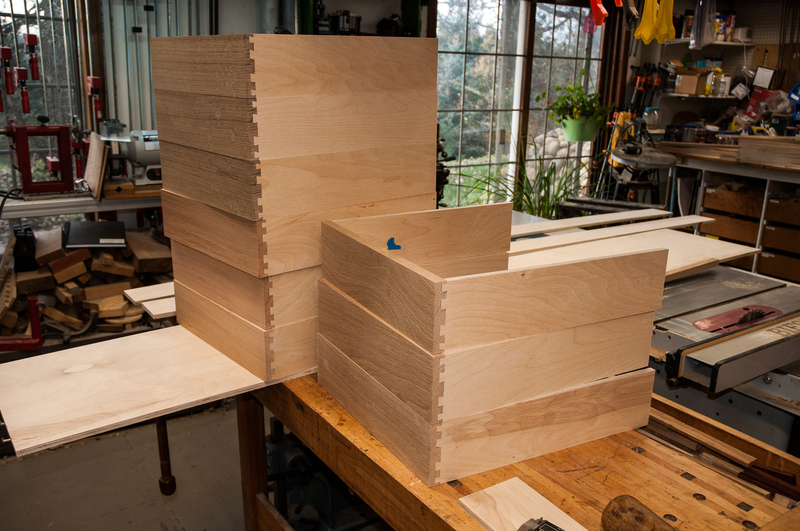 Plus the backs are shorter than the sides so I could re-cut some sides where the dovetails were messed up. These are cut on the table saw. 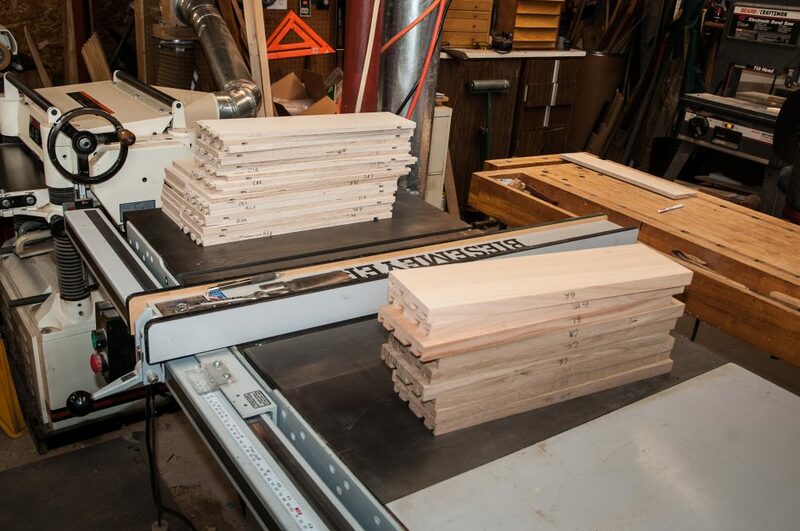 The plywood I am using is 5.2 mm thick which is too far under the 1/4″ minimum of my dado sets. So this become a 2 pass cut on the table saw. The key point in setting this up is that you want the dado ends to be under the side dovetail tails . This will completely hide the groove when viewed from the outside. The photo below shows the alignment of the first cut which will be the top of the dado. At this point there is a lot of time invested in the sides. 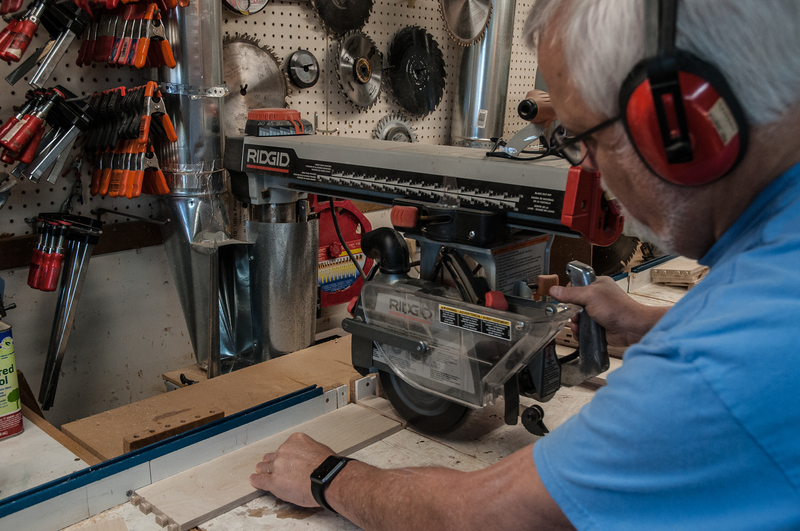 Cutting the dado incorrectly will ruin a side. So I carefully double check the orientation of allof the pieces and stack them so they are ready to slide against the table saw fence. This reduces the chance for error vs. “flipping on the fly”. Once all of the sides, fronts and backs are cut make a few extra test piece cuts. The alignment of the fence for the second cut takes a bit of trial and error until you get a good sliding, but not overly loose fit on the plywood for the bottoms. I tend to re-use the test cut scraps multiple times. Now adjust the fence, make the test cuts and test for fit against the plywood for the bottoms. When making the cuts, be sure to hold with even pressure so that the piece does not ride up over the blade, reducing the depth of cut. I often will use a top feather board for this but skipped it this time, which resulted in some extra fine tuning at final fit-up. I will completely dry fit assemble each drawer before gluing. This gives me a final chance to fine tune the fit of the components. I can adjust the dados with a chisel but prefer a dado plane and side rabbet plane as shown in the photo below. Scrape or sand off any marks on the inside faces of the drawers at this point as it is far easier now than when fully assembled. If fitted properly the dovetails need no clamping. The only clamp required is for the backs. The drawers are all placed o stacked flat to prevent racking and are checked for squareness. 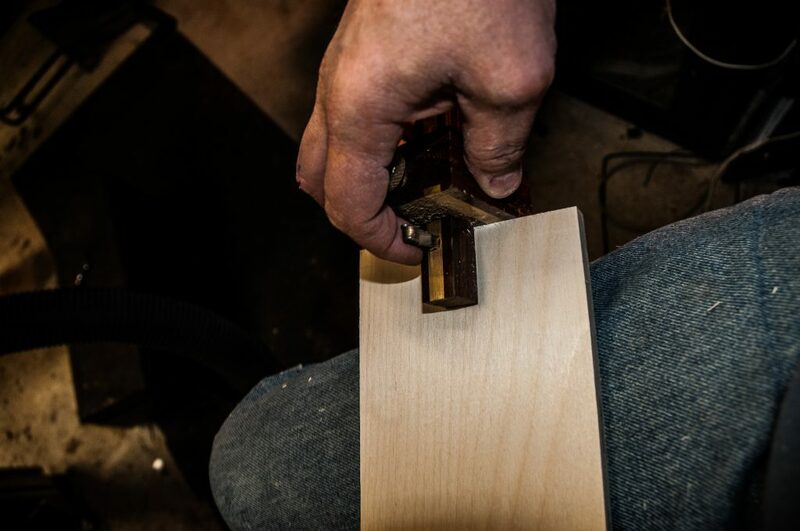 A few taps with a mallet will usually fix any minimal out of square. Look up and down the dovetails after assembly making sure the sides / tails are evenly inset for the full height of the drawer. The fronts will be trimmed flush with the sides after the glue dries. I will clean up the glue squeeze out after a few hours. This makes the least mess. So 9 drawers done, and 18 to go for the dresser project. Sweet Potato Pecan Pie has become a Thanksgiving and Christmas staple for us. 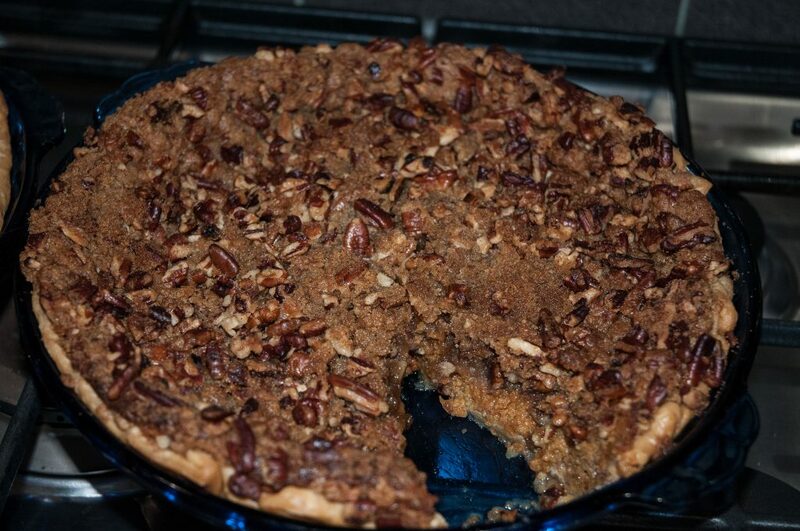 Originally, I was intrigued with Sweet Potato Pecan Pie after having it on some trips to New Orleans for trade shows. I spent some time searching for a recipe to use and the basis for what we do is in Bill Neal’s Southern Cooking book which is now over 30 years old. We have modified it, of course, but it is true to its origins with the flavor kicked up a bit. It does take 2 days to make as the sweet potatoes must be baked and cooled before preparing the pie. We typically make it a day or 2 ahead to ease up on the holiday food prep craziness. Plus it sets up better after chilling, making serving easier. While I love it warm from the oven, (and this is why there is a small wedge missing in the photo) it won’t serve well being too soft until chilled. Take 1-2 large sweet potatoes, scrub and poke full of holes (unless you want a grenade in the oven) . Bake at 375 for 2 hours on flat pan with parchment paper to ease clean up. Remove, cool and scrape out the insides. These are then mashed in preparation for making the pie. We usually do this the day before making the pie. Cream the butter with sugar and sweet potatoes. Next beat in the egg yolks and milk. Add the spices and salt and liquor continuing to beat the mix. Whip the egg whites in a clean bowl and then gently fold into the rest of the mixture. Add the filling to the shell and bake. Place on a sheet pan as the filling will rise a LOT and may spill over making a huge mess. (I really don’t like being on even cleaning detail prior to the thanksgiving baking, again) After 15 min then add the topping (below). If you do this too early the pecans will burn. 1 cup chopped pecans – this is WAY more than the original recipe called for but is needed. After adding the mixed topping, bake for an additional 45 min (longer than the original) until the filling has set to a custard like consistency. If the pecans are getting too dark, tent with aluminum foil right away. We always assume a custard pie will take longer than the recipe says. Burnt pecans spoil the flavor. For serving top with fresh whipped cream (not that stuff from the tub or can) . So go ahead make a slow food desert and forever settle the question of “Should I have pumpkin or pecan pie or both…” This has the best flavors of both and is better overall. 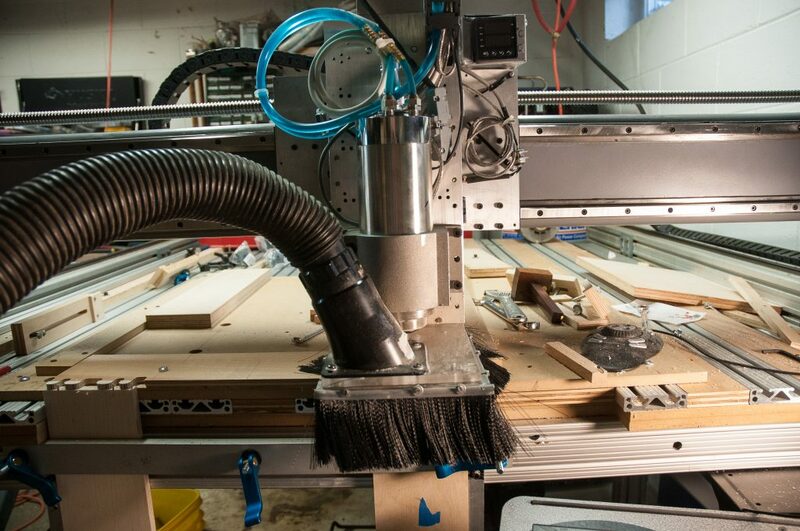 One of the goals when making the CNC router was to be able to do general woodworking joinery including dovetails, sliding dovetails and mortise and tenon joints. The mortise and tenon capability was proven out when I did the blanket ladders. The dovetails needed another project and the dresser project with 27 drawers is a perfect fit. The CNC router was set up with a special base for the dovetails and the horizontal fences were CNC routed to final spacing in place (20″ apart) to match the vertical fences. 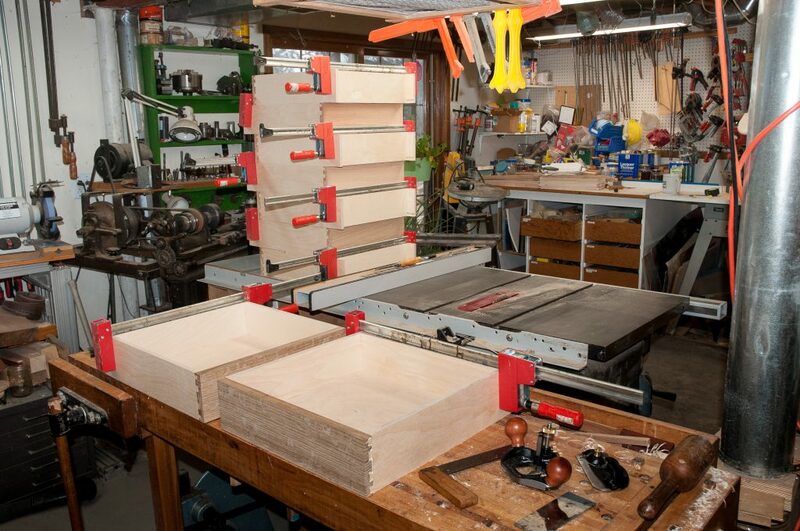 Over the last week I had prototype the joints using JointCam and using scrap pieces of plywood that were of the approximate thicknesses of the drawer fronts and sides. I tested both equally spaced and equal spaced dovetails and both turned out well after a bit of initial tuning. Teal liked the equal spaced better and these could be done with both pins and tails in one pass so this was chosen. The drawer faces are white or red oak depending on the dresser . At this point I am doing the top row of smaller drawers. 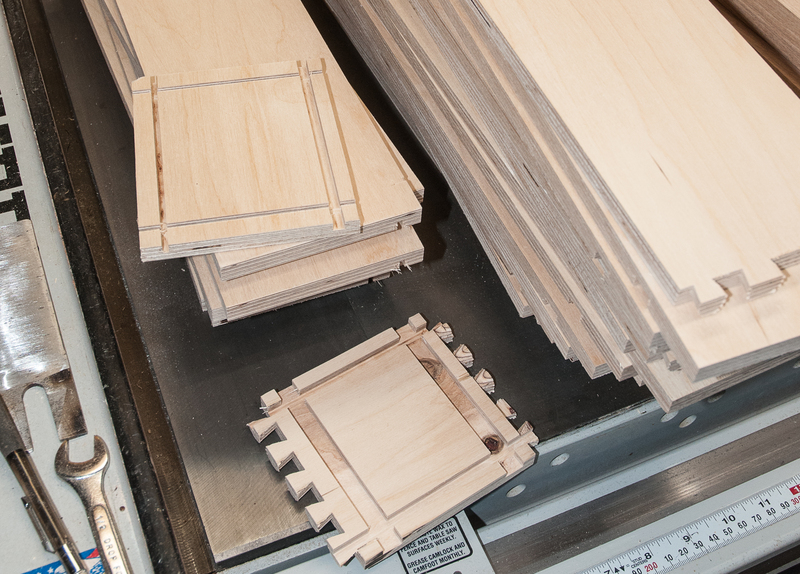 The 3 top drawers for each dresser are cut from a single board so that the grain runs across the face of the dresser. If one is botched then all 3 are scrap. So there is a bit of tension here with some nice pieces of quarter sawn white oak (big flakes) and near quarter sawn red oak for the drawers. 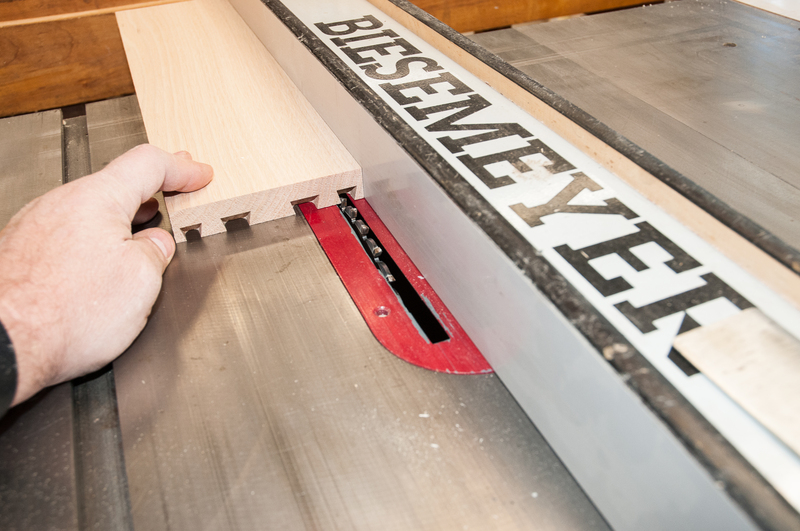 The drawer faces are approximately 3/4″ thick. The drawer sides are 1/2″ nominal (0.47″ actual) baltic birch. 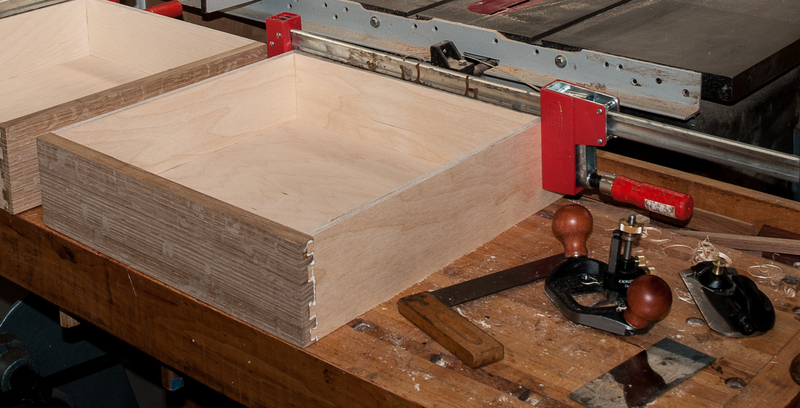 I like the baltic birch plywood for drawer components. The even coloring and lack of voids make for nice side pieces. The off cuts were again tested and everything seemed to work although the joints were a bit looser than expected from the earlier testing . Jointcam has a setting for adjusting the fit and this was used. New pieces tested OK so on to the real stuff. At this point things fell apart. The router bit was progressively creeping out of the collet during the cuts. This was apparently exacerbated by the oak drawer fronts. I reduced the feed rates and increased the spindle speed but it was still happening. I tried a new dovetail router bit with a longer shank and really cranked down on the collet but it was still creeping out and then the shank of the router bit snapped just past the collet. Time for a beer (or 3) and think through the alternatives. There is not a lot of info on the net about CNC cutting dovetails. There are bits on commercial work where you cut everything flat and add a false front, but little on the trials and tribulations of doing this properly. The JointCam info mentions the use of roughing and dovetail bits and passes but no guidance on when to use this vs single pass. So after the beers and sleeping on it I decide to be conservative and use a roughing pass (straight bit) and finish pass with the dovetail bit but switching to a 1/2 ” shank dovetail in the hope that it would grip better. I had one more of each on hand – 1/4″ straight and 1/2″ 14 degree dovetail with 1/2″ shank. As you can see from the photo below, the pieces are cut 2 at a time as right / left pairs. Testing went well. However it is tedious as you need to do a bit change for each test (straight and dovetail passes). So by late morning it was a go for this method. Now I just had to make a new set of drawer fronts for the dresser that had them ruined in the first try. I also found that while JointCam makes a scoring pass for the dovetail / finish bit, one is needed for the roughing pass on the plywood sides. The side faces tend to splinter easily. So I took a marking / cutting gauge and scribed a line across each of the sides before routing. This contained the splintering. I did the drawer fronts first. These were labeled as to sequence on the dresser, inner face and top edge. The top edges were placed against the fences on the CNC router. First pass for the stack of pieces was with the straight bit. After all were run, I changed the bit to the dovetail (and it is nice to have a soft mat under the edge of the CNC to catch the dropped bits vs. the concrete floor). Now that the fronts were done (pins) and they fitted reasonably well against the test sides it was time to do the sides (tails). These were cut and after the first pair I test fitted them to the fronts. They were close but there was still some variation form one front panel board (set of 3) to another. One small adjustment of the fit clearance (-.001 to +.004″) was made in JointCam for the sides to match the fronts. At this point the sides are labeled right and left (blue tape on the rights) and for each dresser set. There was still some tweaking to do. One set was still tight even with the +0.004 correction. These pieces were tight and had a gap at the end of the tails. So I took this set of 3 to the drum sander. I took off about 1/64″ on the inside face and everything fit nicely. So now I have the 9 drawer faces and sides fitted up and ready for the dadoes for the bottom and backs. One of my favorite things about going to a good barbeque joint or smoking my own meat is the crispy pieces around the edges. A common restaurant appetizer is “burnt ends” made from smoked brisket. So far my own smoked brisket has been less than spectacular and I have been looking for a way to make the beef consistently good. I wanted to try a combination of sous vide cooking and smoking to get the best of both worlds with a more predictable outcome. The idea was to use sous vide to cook the meat, break down the connective tissue with the smoking for flavor and caramelization. However, a search turned up only a few recipes of this sort with huge variability of cooking technique. So I decided to experiment on my own. This recipe was an absolute success. It yielded succulent tender beef with a nice smoke flavor (and smoke ring) and caramelized exterior. Mix the above ingredients and rub into the beef pieces. Place everything into a bag ready for sealing for sous vide cooking including the left over rub. Cook in the hot water bath at 155F for 24 hours. Cover the pan or add water every 8-12 hours as there will be significant evaporation. Remove the pieces and cut the biggest ones so nothing is more than 1″ thick. Smoke on indirect heat at 200F for 4 hours . I use a Big Green Egg and put the conveggtor down under the grate. Keep the pieces away from the direct heat at the edges or they will burn. Chill the juices and skim the fat. Then reduce the liquid until it is about the consistency of BBQ sauce. This took about 1 hour in a large glass baking dish at 350 in the oven (stir once or twice). Remove the pieces from the smoker and cut down to max 1″ pieces per side. Lightly stir them into the reduced liquid and the brush with your favorite BBQ sauce (we use Sweet Baby Ray’s). Bake at 350 convect or put on the grill again for another 30 min. This will caramelize the sauce and meat edges. Be careful this will burn easily at this point. The reason for incrementally cutting up the meat was to have it neither dry out or crumble to nothing. Chuck roast is really a mixed bag of meat muscle types all rolled into one and it is hard to have the leaner portions and fatty portions get done nicely and all stay together if you immediately cut to 1″ pieces. At the start, I had wondered if there would be a visible smoke ring on the pre-cooked meat and there was – nice bright pink. Plus the smoky flavor came through nicely, which was probably helped by the sweet rub. I used several chunks of cherry wood 3″ diameter branches for the smoke (well soaked due to the rain). Having some of the candied jalapenos to go with them just adds to the sweet and tangy flavor. Some fresh baked bread (I did a sourdough whole wheat / rye combo) is great to sop up the sauce.